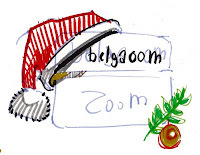 I ve made a custom christmas logo for belgacom tv. Here is the sketch from where I did the final logo. Here is the logo made in Photoshop. Soon I will post the final logo, which is slightly different and animated.